Sonic the Hedgehog 4 is the fourth issue of the Sonic the Hedgehog comic series. It was released in November 1993. This comic features two stories: The Lizard of Odd! and Tails' Little Tale. It also features five featurettes: Antoine's Vain Refrain, Robotnik Birthday Card, HorizontAL & VertiCAL, Bad-Niks Bazaar, and Hare Styling. 1 The Lizard of Odd! An angry Dr. Robotnik proclaims his hatred toward Sonic the Hedgehog, stating the next animal to be brought to him will be turned into a killer robot. Coincidentally, Crabmeat shows Robotnik a truck that has just arrived with a new animal prisoner. The two rush outside as two Swatbots hoist the extra large animal container to the ground. The Swatbots open the container, warning a curious Robotnik to stand back. The door opens to reveal a tiny salamander. Robotnik turns to a Swatbot and yells in anger over his disappointment. Nonetheless, he decides to continue on with his plan, but has Crabmeat send the three Swatbots to the Slag Shop for life. In his lab, Robotnik drops the salamander into his roboticizer, ordering the nearby Buzzbomber to start it up. Before it can, Robotnik exclaims that he's sweating hot and orders it to put on the air conditioning as well. The Buzzbomber accidentally pushes the size control knob on the roboticizer, thinking it's the A/C. The entire facility explodes as the salamander turns into a large robotic salamander, proclaiming itself Universalamander. Meanwhile, in Knothole Village, Sonic, Rotor and Sally Acorn are watching the Great Forest Monitor. They watch in shock as the Universalamander appears on the screen and begins destroying the Great Forest, while coming their way. Sonic doesn't waste any time and leaves the secret village to the surface. Upon arriving at the surface, Sonic watches Robotnik fly by in his Eggmobile, proclaiming that Universalamander is too powerful and that he is leaving Mobius. Sonic looks over to see the Universalamander leering right over him, bigger than he expected. He enters a spindash and launches himself at the robot's head, only to end up stuck in its mouth. The others in Knothole look on in shock as they see the Universalamander eat Sonic, and begins to walk off. The Knothole residents continue to watch on on the monitor, when Sally notices something happening to Universalamander. It starts to feel woozy, as Sonic is still alive in its mouth, spinning around causing gas to build. Universalamander lets out a huge burp, letting Sonic escape. It rips out a pine tree and chases after Sonic, trying to hit him with it. Sonic, earlier, had collected all seven Chaos Emeralds and fifty rings, so he hops into a nearby starpost. He enters the special zone, where he has to collect fifty more rings without hitting any bombs. He is able to successfully get fifty rings and exits the zone, becoming Super Sonic. Super Sonic approaches Universalamander, who proclaims he needs to get through him to stop him. With his new powers, Super Sonic takes it literally and goes right through the robot with quick speed, leaving the Knothole residents baffled as to his actions and speed. With his speed, Sonic goes behind Rotor and asks where the robo-machine retrieved from the previous issue was at. Boomer tells him its in his shop. As he leaves to grab the utility, the whole group reacts in shock that that was Sonic. Sonic, meanwhile, jumps out of the secret Knothole entrance with the shrinker/enlarger of the machine and activates it before the Universalamander can get to him. Now shrunk to small size, Super Sonic intimidates it with his foot, causing it to run away. With the Universalamander threat gone, the Knothole residents celebrate with a feast. Super Sonic, with his 'super' sense of humor, put a whoopee-cushion under Antoine D'Coolette's seat, ending the day with a laugh for the whole group. Antoine is quoting Cyrano de Bergerac and one of his plays, making numerous references to vanity. In the end, he flops on the floor, only to be awaken by Sally asking if he's done assembling her vanity. He picks up the instructions, causing him a great amount of confusion. A foldable birthday card with the cover showing Robotnik saying he's going to roboticize the reader, only to wish them a Happy 'Botday' in the center of the card. The two beings known as HorizontAL and VertiCAL introduce themselves, saying they've received many Sonic-grams asking for their return. They tell the reader about themselves, that they live in a special zone where there are no laws of physics. HorizontAL throws a baseball at VertiCAL, but it wobbles all over the place causing him to miss and strike. With no laws of physics, they have the 'wickedest' curve ball ever seen. The Super Special Sonic Search and Smash Squad are not happy with Sonic. Coconuts throws a coconut to the ground, causing it to explode, saying he'll destroy Sonic with one of them. Scratch, meanwhile, says he'll peck Sonic into submission, pecking into the wall to show. Grounder launches some missiles from his hands, saying he can take care of Sonic with his Sonic misguided missiles. On the other side of the room, a receptionist for a villain audition behind a desk tells the three to keep quiet. A number of other villians trying out look at the three, unhappy, thinking they're showing off. Sonic, while travelling through Knothole, comes upon Bunnie Rabbot, who has opened a hair salon and invites Sonic in, saying she'll fix up his hair after she is done with Sally. She takes a seat as Bunnie walks over, saying her life goal is to be a hair stylist, fighting Robotnik otherwise. She tells Sonic to come in, and that her work will only take one second as she has one style. She sticks her robotic foot in a nearby water puddle and puts her robotic hand into Sally's hair, causing it to frizz, proclaiming it as 'instant permanent'. Sally looks in a mirror pleased, but Sonic is not. Sonic is sleeping under a tree, so Tails decides to take over his hero job. Before he can start, Sonic slowly awakens, but Tails is able to talk him back into sleeping. He runs off to defend the forest and Knothole Village. He stands on top of a large hill, looking out for any trouble nearby, failing to notice the significantly large picnic organized by Robotnik for his badniks below him. Robotnik orders his badniks to attack the forest, with a Buzzbomber and Orbinaut noticing Tails on the hill. The Buzzbomber grabs Tails and holds him for target practise for Orbinaut. It fires one of its spikes, but Tails reflects it with his hand back at the Orbinaut, knocking it out. He then takes his two tails and breaks the Buzzbomber into many pieces. With new found confidence, Tails flies into Robotropolis to take out Robotnik. He enters into a factory building, seeing a shadow of Robotnik. He chases after it, only to hit a wall; the shadow was from a Swatbot doing hand puppets. The Swatbots there take a dazed Tails and carry him off to the roboticizer. Right before they can drop him in, Sonic appears, spooking the Swatbots into dropping Tails. Before they can be stopped by Sonic, they activate their self-destruct mechanisms. Sonic quickly grabs Tails and they run out of the city just as they explode, destroying the factory. Later, while walking along Green Hill Zone, Sonic tells Tails that he hopes he was taught about patience. Tails, walking along, states he'll look before he leaps...only to leap into a pit. The Super Sonic form is introduced in this issue. Sonic refers to the Jurassic Park game for the Sega Genesis in The Lizard of Odd!. The Lizard of Odd! part 2 makes reference to the Chaos Emeralds and starposts, the first time they are mentioned in the series, and the special stages from Sonic the Hedgehog 2. 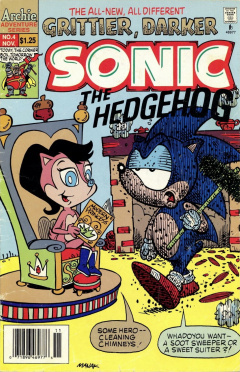 The cover of issue 5, shown in the Sonic-grams segment, is different from the final design.